I love this quote, because it really resonates - and not just from when I was a kid; I still feel like I change my handwriting quite a bit. Not to mention the different lettering and calligraphy styles I'm learning. I've always been fascinated by personality and what makes us, us, which is why I spent many years studying and practicing cross-cultural and personality type coaching and training. So can our handwriting really hold clues as to our character? "Graphology is a technique that allows us to become knowledgeable of ourselves and also explore those who surround us. Through the study of letters called graphological analysis, it is possible to study patterns of writing that identify the psychological state of a person and to evaluate the characteristics of their personality. It is an economical method, fast and exact. It is applied as a complementary graphical projective technique of psychology in order to detect slight or profound conflicts and to contribute to diagnosis and follow up. It is also applicable to other areas such as medicine, psychiatry, law, criminology, education and personnel selection in companies." 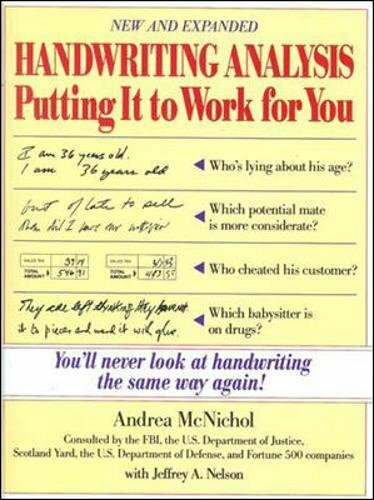 Graphology (or graphoanalysis, but not graphanalysis) is the analysis of the physical characteristics and patterns of handwriting claiming to be able to identify the writer, indicating psychological state at the time of writing, or evaluating personality characteristics. It is generally considered a pseudoscience. The term is sometimes incorrectly used to refer to forensic document examination, due to the fact that aspects of the latter dealing with the examination of handwritten documents are occasionally referred to as graphanalysis. Take a piece of white, blank paper, and using the pen you normally use, write a letter to a friend. You don't have to send it, or maybe you will. Either way, you want to have a good couple of paragraphs of your spontaneous, everyday handwriting about a topic with some sincere connection to examine. Or in other words, your grocery list doesn't count. Let's start by looking at slant, ascenders, descenders, size, and form. Leaning to the right indicates a future-focus, reach towards others, and extraversion. Leaning to the left indicates a past-focus, reach towards family, and introversion. Upright indicates a focus on the present and the self. Larger size and higher quantity ascenders indicate spiritual and mental activity, including imagination and creativity. Larger size and higher quantity descenders indicate a practical and realistic outlook, including reliance on the senses and the body. Equal spacing between ascenders, descenders, and x-height indicate a balanced, emotionally stable person, who is able to control their impulses. Large letters (>3mm in oval diameter) indicate self-confidence, extraversion, and a person who is expressive, generous, potentially arrogant, and tending to generalizations. Small letters (<2.5mm in oval diameter) indicate lower self esteem, introversion, great concentration, and a more meticulous person who might also be withdrawn, wants to go unnoticed, and pessimistic. This and many other topics are what I'd like to start exploring during monthly Pen Meets in Brooklyn. We have a waitlist for tonight's event, but please sign up for March if you're around!